JANUARY: Lava is still all over the place. It pours into the ocean at Laepuki (1 mile from the Park road) most of the time, although it sometimes disappears. On the eastern side, the a'a flows from December crusted over and started feeding slow-moving pahoehoe flows on the flats. These flows eventually covered over part of the Royal Gardens access road and started filling in a wide low area at the base of the pali (slope). On January 15, Cheryl and Ken spent four hours filming a time lapse sequence of a sheet flow inflating about 5 feet. Click on the photo to the right to see this process in action (clip is 480 kb). Another flow is sitting at the top of the pali, burning forest and not really advancing. video clip (avi 550 kb). 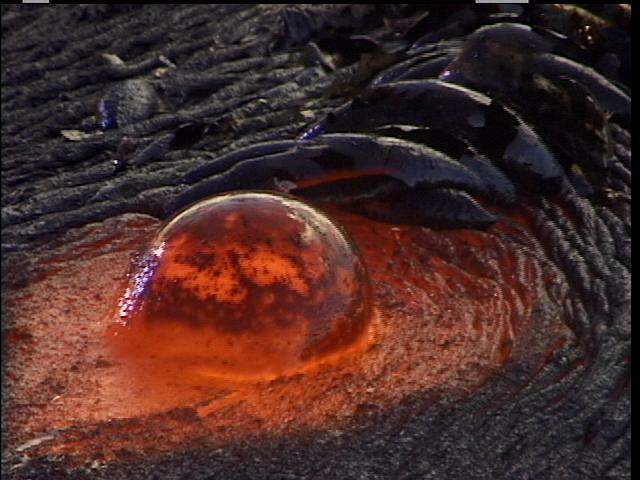 APRIL & MAY: Lava made it back to the ocean, entering in several small dribblets. 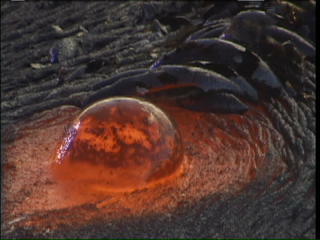 On May 1st, television viewers were treated to Matt Lauer of the Today Show visiting the lava flows of Kilauea. Jenda was on hand to help guide their crew in and out, and she got some shots of them at work. June was fairly quiet, with lava just flowing into the ocean. © 2000 Volcano Video Productions, All Rights Reserved.